Creating this design also reminded me of the importance of using a piece of scratch paper underneath your work for doing things like testing ink pads before applying an image to your card. I’ve also gotten in the habit of writing down the name of the ink pad color on the scratch paper so that later on I can remember exactly which one was used if I need to make the card again. It’s also a good way to test color combinations if you’re having a hard time picking a color palette to work with. Both of these stamps (the row of hearts and the sentiment) are older stamps that I’ve had for years by A Muse Art Stamps. The ink pads used are all by Stampin’ Up!. Happy crafting and wishing you tons of love, too! 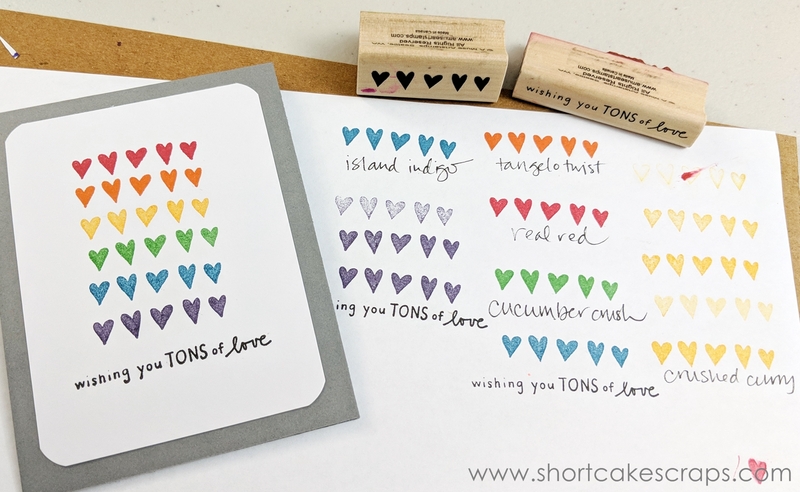 This entry was posted in card making, cards, crafts, Stampin' Up, stamping and tagged a muse stamps, card, card making, colorful, hearts, ink pads, love, rainbow, stampin up, stamping, valentine by shortcakescraps. Bookmark the permalink.